View More In Food Preparation Equipment. 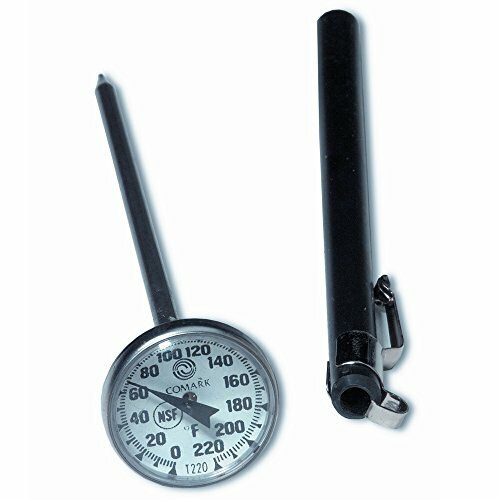 The UltraSource Pocket Food Thermometer has heavy-duty construction featuring premium grade 304 stainless steel and clear, magnified easy-to-read dials. The food safety thermometer lens won't shatter, and it has a protective sheath. It is dishwasher safe and no additional tools are required. This professional-grade thermometer provides an instant read on internal meat temperatures from 0- to 220-degrees Fahrenheit. Stainless steel construction is light, tough and shock-resistant. The thermometer features black graphics on a white background for easy, at-a-glance measurements. This thermometer is NSF approved.